I've heavily modified and updated bobisback's RimworldConflictFinder, expanding on his nameDef check, and adding a bunch more mod checks and validations. Or attached to this post. Extract files from zip to any folder. Run RCC.exe from windows or from a dos window. When RCC.exe is run it will open the UI for you to pick at least 2 paths (RimWorldWin.exe & Mod folder path). 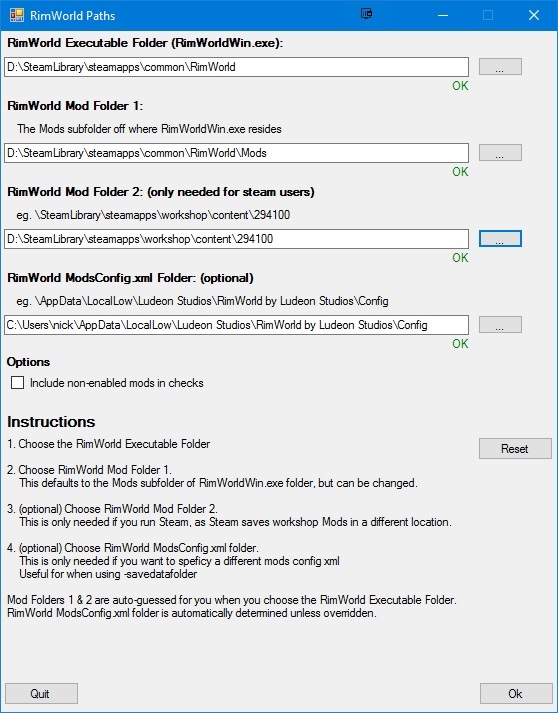 The first 2 folders are required (Mod folder 1 is auto-calculated when you choose the RimWorldWin.exe folder - but it can be changed). (optional) Mod Folder 2 is only needed for Steam users. (optional) Able to also include all non-enabled mods in all checks. All findings are reported to file RCC.txt in the same folder as RCC.exe. Each check, or main function of the program is delimited by "============"'s. Be sure to scroll down RCC.txt, as there are checks all the way through the file. There is also a (work-in-progress) form which currently only displays the mod load order and numbers of conflicts for each. NB: Uses opensource library NBug to submit crashes to a Mantis tracker so I can fix any issues. Feel free to block it if you do not want the reports sent. Please report bugs in this thread, or on GitHub. Copying to clipboard on results form might crash the app. Check if CCL is compat with RimWorld. Check if root, tag, defname are valid (by parsing core). Check if a mod is valid - needs about.xml, at least one XML or dll. Check if mod exists twice. a) based on folder name & b) based on About.xml name. Check if a mod's defname conflicts with another defname of the same mod. Change output to tabbed tables in a Windows Form." License: GPL 3.0 Please include credit. 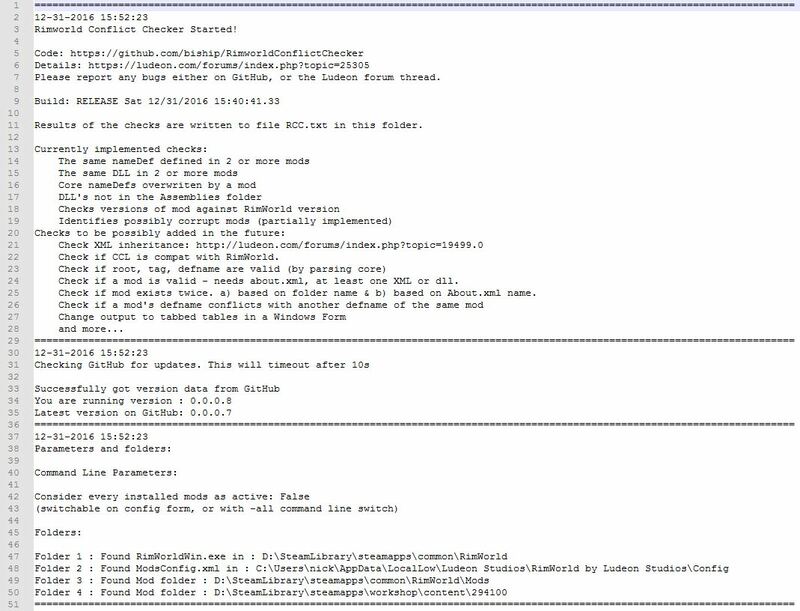 0.0.1.1 11/29/18 Updated to support Rimworld 64bit executable. 0.0.1.0 07/02/18 Updated to support Rimworld 1.0. Updated dependencies. Added ability to turn off log details. 0.0.0.4 09/09/16 This tool will now check and notify on updates for it. More info on results form. Loads of bug fixes! Very interesting tool. I, too, come from the Fallout / Skyrim Nexus modding community and I think tools like this and a proper mod manager is what RimWorld mods really need to work better. The day we can make merged patches, man, that'll be the life. I feel this would be better off right inside Rimworld in the PostLoad method as a mod that runs last and generates the report. Everything needed is available at LoadedModManager.RunningMods at PostLoad before they are squashed into the DefDatabase. Utilities are always so under-done. Heads up, this utility stops its working thread if the 3rd folder (2nd mod folder, i.e. Steam Workshop) is not found. You should probably just let it run even if one of the mod folders is missing. Ah, when its run from command line, it reports the missing folder and aborts, but when just running RCC.exe it aborts and you don't get to see the error. I'll add a error popup when using the UI - thanks for the report. I meant you should let it check for conflicts even if a Steam folder was configured in the UI but was not found (incase the user deleted their Steam mods or something). Yeah I understood you, but if I don't tell the user the folder is invalid, they might think they set it correctly. Then if I let it run anyway, it will either not check what the user intended (if folder doesn't exist), or it will start examining non-mod files (if folder exists, but is not a mod folder). I'll put in a few more validation checks on the folder picker. I don't really like ignoring or processing incorrect entries, but I'll see if giving the user the option to run anyway is acceptable. Hey thank you for this amazing mod. I've noticed you haven't seen much appreciate for this great tool anywhere else but I just wanted to let you know this tool is priceless! I'm running a modest amount of mods (68) and being able to see all the conflicts that occur is a must. So thank you! I love this tool. With it creating combatibility patches is no longer a guessing game. Also with a few bug fixes & disabled checking for non-enabled mods as it only added time and log spam. Dude ... would you mind, stop reading my mind? One day there will be a folder picker for ModsConfig.xmlAlthough it is rather easy to fix on my end. Anyway thank for fixing my problem and thank for this tool. Why's it not finding your modsconfig.xml? Can you zip & attach your RCC.txt? Glad you are finding the tool useful. -savedatafolder="[Rimworld_dir]\SaveData"This allows me to easily maintain several independent configs, for testing or just completely different modded games. So it is to be expected, that it didn't find it. For now I've just copied the modcfg over to the original dir.